The actor, who applied for and got Russian citizenship in protest against the newly-introduced French tax on super-profits, will now have to pay a lot in taxes to the Russian treasury. Russian citizen Gerard Depardieu keeps getting more properties in the territory of his new motherland. The greatest gift that he has received so far came from the head of the Chechen Republic Ramzan Kadyrov. In the Republic of Mordovia he has a home, too. In the meantime, although Depardieu is so sensitive about paying too much in taxes in France, there will be no escaping them in Russia as well. On Monday, Ramzan Kadyrov presented to Depardieu, who now holds the title of Chechnya’s honorary citizen, the keys to a five-room apartment in the residential complex Grozny-City and property registration documents. The two-tier apartment with a floor space of 200 square meters is on the 27th floor of an elite residential compound. The Chechen authorities have declared that the apartment for Depardieu was purchased not at the budget’s expense, but with money from the fund bearing the name of Ramzan Kadyrov’s father, Akhmat. Grozny-City is the tallest apartment building in Russia outside Moscow. It is located in the very center of the Chechen capital. The high-rise buildings ranging 18 to 40 floors in height overlook the Sunzha River, at the intersection of the Putin and Kadyrov avenues. Most of its dwellers are businessmen and officials. The residence of the head of the Chechen republic is about a ten-minute-walk away. At the lower tier of the apartment there is a room for recreation, a terrace and a living room, and on the second tier, there are two bedrooms. The rooms have not been decorated yet. The apartment has just bare concrete walls and all fittings and fixtures. The apartment building is luxurious, with a helicopter pad, high-speed elevators, an independent power generator, an underground car-park and round-the-clock security. For the car park and security the dwellers will pay 150,000 rubles a year each. Depardieu, who applied for and got Russian citizenship in protest against the newly-introduced French tax on super-profits, will now have to pay taxes to the Russian treasury. Possibly, his first such contribution will be a tax on gifts. The apartment he has got as a present from Ramzan Kadyrov has a number of encumbrances, including the gift tax. Those persons who have lived in Russia for no less than six months, even though they have Russian citizenship, are obliged to pay 30 percent of the value of the property they have got. Further on Depardieu will have to pay regular property taxes to Grozny’s treasury. The daily Izvestia quotes developers as saying one square meter at the upper stories of Grozny-City is estimated at about 80,000 roubles ($2,700), so Depardieu’s apartment costs at least 16 million roubles. Depardieu is reported to have got the apartment as a present, so the 30-percent gift tax may prove as big as 4.8 million roubles. Apart from the lump sum tax on an income received in the form of property given to him as a present Depardieu will be expected to pay a property tax, although a small one. Experts say it will no greater than 1,500 roubles a year. In the meantime, in the capital of the Republic of Mordovia Gerard Depardieu a week ago was registered in an elite apartment. However, he is just registered there. The apartment is not his property, so he will have to pay no taxes. The apartment belongs to the son of Depardieu’s friend, director of the state film archive Gosfilmofond Nikolai Borodachev. In the meantime, in Mordovia’s capital Saransk local officials have been looking for a place to build a detached cottage for Depardieu. Some say the French actor has asked for a small Russian-style house by the river, and not a large family home. He wants to go fishing in the mornings and make pancakes himself. He has not mastered the skill of pancake making yet, but is eager to learn. 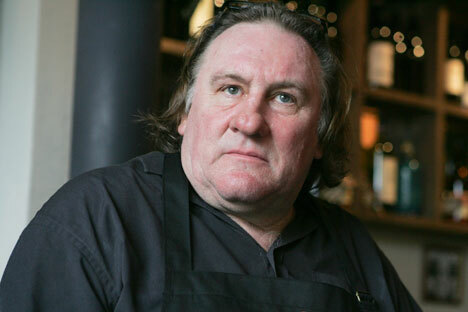 In a gesture of gratitude to the hospitable land of Saransk Depardieu will open a French restaurant.